WIN a coaching session or a ticket for the HippoLogic Clicker Challenge. If you know me, you know I am a huge fan of celebrating successes. I know this year my blog will hit the 100.000 views! Something I didn’t foresee when I started. Time to celebrate! With you! This is how: I will give away a 30 minute coaching session ($35 value) or a ticket to participate in my HippoLogic Clicker Challenge ($47 value). I started this blog as an online (accountability) training journal to tell my friends and family (and maybe a few strangers) about Kyra’s training. She was 11 months old en just caught out of the wild (a nature reserve in The Netherlands). She didn’t want to deal with people, she was super scared for everything and only ate hay. No carrots, apple, sugar cubes of horse treats. Quite a challenge to start with positive reinforcement. After 3 weeks of daily training (twice a day in the first week) I could approach (a BIG deal! ), halter her, touch her all over, lead her over the premises (only if other horses stayed in eye sight, but it was a start), lift her feet and even disinfect the wound on her leg with a spray can. Every month I put a summary on my blog to list our achievements. Kyra was my first horse that I made clear goals for (taming her was my #1 goal). It is because I wrote down my goals, discussed them with my best friend, my accountability partner. I also kept track of how I trained behaviours and kept a logbook so I could reproduce my results. This all lead to developing HippoLogic’s Key Lessons, Your Keys to Success in Positive Reinforcement training program. 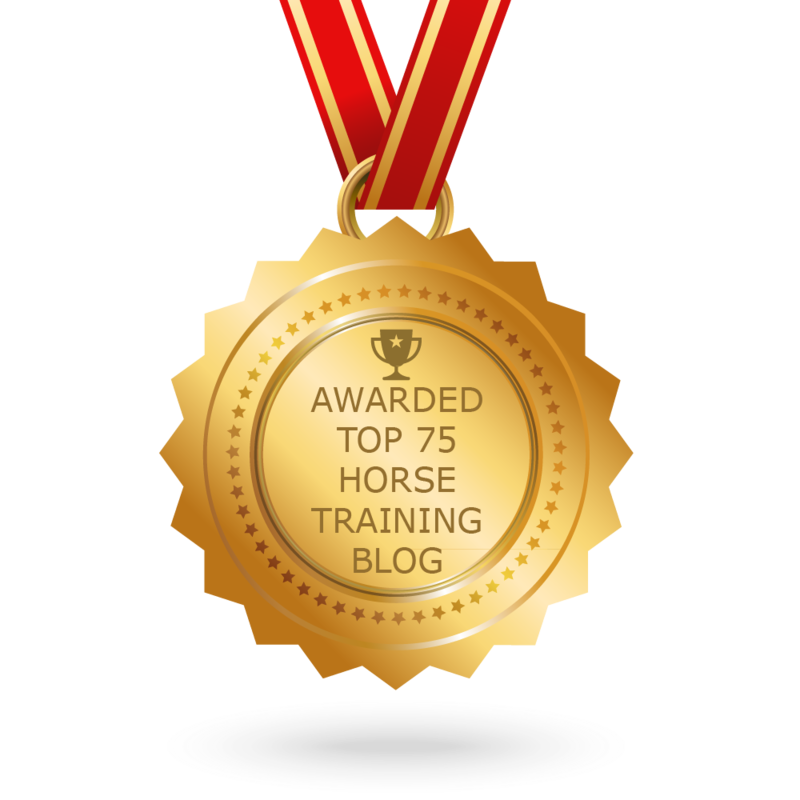 I wanted to develop an easy to follow step-by-step program for horse lovers who want to implement clicker training. Becoming a blogger was an important step in this whole process. I want to celebrate this with you: my readers and loyal followers of my blog! In 2012 we (my husband, our 1 year old son, our 2 cats and Kyra) emigrated to Canada. I changed from working mom to stay-at-home mom without a social network in my personal life or in my horse world. I left all my friends, family and horse riding clients behind and I really missed them. I struggled, I had happy times, felt lonely, was home sick, was happy again. I felt it all! Then, in 2014, I decided to restart my blog, so I had something to do besides being a mom. I missed teaching riding lessons and helping equestrians so much! In October 2014 I wrote my first blog in English. I posted 9 articles that year. Yes, that is how I started. Now I publish about 100 each year. In order to celebrate my upcoming 100.000st view I decided to give away a 30 minute coaching session ($35 value) or a ticket to participate in my HippoLogic Clicker Challenge ($47 value). Since the receiver determines the reward: you choose your price. What is *your* favourite article of all times from my blog? Visit my blog (https://hippologic.wordpress.com/) and scroll through the categories or use the search bar on the right to find the one that you like best. Are you tired of your horse repeatedly spooking over the same things? Are you getting impatient that he is still scared of object X while he has seen dozens of times? Do you think you and your horse’s lives would improve if you could teach him to just ‘get over’ it? Here is what you can do. First of all I would like you to realize that your horse is a responsive animal and when he is fearful he wants to survive and get away from the scary thing. He is not testing you, he is not acting as if he’s scared or pretending. He is not, he just responds to his environment and ‘acts’ accordingly to his instincts. The same instincts that kept the species alive for thousand and thousand of years. Watch the video below of Kyra and you can see she is not pretending. She wants to run away, but she also wants to explore what scared her. If she knows it is safe she doesn’t have to run away and use energy that she might need later. With positive reinforcement you can easily teach your horse to target an object with his nose, that is called targeting. Once your horse knows how to target and he has experienced over and over again that he is getting something wonderful when he does, he wants to target more objects. He now knows from experience that targeting brings him good stuff: a click (the marker to pinpoint his exact behaviour that gets him the treat or another positive reinforcer) and the reinforcer itself (the treat). Once your horse knows and likes to target you can ask him to touch other objects too, like a plastic bag, a cone, an upside down bucket or a huge horse ball. Click and reinforce every tiny step towards the desired behaviour. This can be literally that you have to click and reinforce every step towards the object you want him to target. Even when your horse is still 30 steps or more away from the object! When your horse wants to leave, let him! Make sure you practise this in a safe environment like an arena or his paddock, where your horse has the opportunity to run away if he needs to. Never punish or ‘correct’ scared behaviour or force your horse to walk towards it, this just adds to his stress and he might associate you to the scary object. That is the last thing you would like to happen! Most horses need a maximum of 15 seconds to examine a new, potentially dangerous object and decided that it is safe. If they think it is not safe they usually run away before the 15 seconds have passed by. Count while your horse is exploring (looking at the object or listening to something in the distance that we don’t hear) and deciding. Once your horse has given the 15 seconds to decide what he thinks of it, the fear often metls away. For good! Don’t be mistaken! Waiting for 15 seconds when your horse is tense feels like a really, really long time! It feels like eternity! That is why you have to count, so you know if the time is not yet up. It really helps! I have tried this with my own horse Kyra and she usually needs 8 seconds before she trusts the unfamiliar object. Then I ask her to touch it for a click and treat. She always does! After this she is not scared anymore. I might still need to train confidence with the same object under different circumstances (time of day, maybe it sounds different when rain is hitting the object or it looks different at night or when its wet and so on) but the amount of fear has always diminished after that first positive encounter. When your horse has done many repetitions of targeting unfamiliar objects you can also ask him to pass by and ignore the object, in order to earn a click and treat. In this way you reinforce and teach him to walk by calmly, even when he is not allowed to examine or touch the object, animal or other horse. Horses are curious by nature and when you let him run away, he will feel safe and find the right distance that feels safe for him to inspect the object. Then he wants to come closer and see what it is. If you can encourage your horse with positive reinforcement to examine the new thing, his curiosity is triply rewarded. First of all because he satisfies his own need to know that it is safe, second because you reinforced him to be curious and third by giving him the freedom to run away to lower his stress. Instead of pushing him to move towards something scary while he is not yet ready to do so. Look how fearful Kyra was for a big ball and how she settled nicely after a few minutes of clicker training. She doesn’t pretend to be fearful, she is really anxious and runs for her life. Can you imagine how stressful it would have been if I had kept her on a lead rope and forced her to come closer? Let your horse decide if something is safe. Give him as much time as he needs! This might only be 15 seconds, but it will save you many scared hours in the future! It is up to him to decide how much time he needs. If you force him to approach the scary thing ‘in order to let him see/feel/undergo it is safe’, it can take longer to get the confidence. This is called ‘flooding’ and if you ‘flood’ your horse, you might create a bigger problem instead of solving it and building confidence in him and you as his trainer. Slowly introduce bigger, newer objects or moving objects. Reinforce often! Let him know what you want by bringing clarity: towards to new object results in a click and treat, but moving away from it is OK too! This is how you build confidence in your horse. Let him figure it out in his own pace at his own terms! I spend a lot of time training ‘calmness’ and ‘relaxation’ in Kyra in new and unfamiliar circumstances. It always pays off, once Kyra is confident to touch an object she is fine with it in the future. Sometimes it takes a while, before she is totally fine with it but when she does I can count on her confidence forever! That is why it saves me time in the long run and it makes me feel safe too!